The results of the second annual Baltimore Oriole Winter Survey from Feb. 12-15 are in, and for the second year in a row, South Carolina had the largest number of orioles winter in the United States. South Carolina's oriole survey was held in conjuncture with the Great Backyard Bird Count, so the Palmetto State could tap into this longstanding citizen's scientist project, to get a better picture of the status and distribution of this beautiful songbird, wintering in South Carolina. According to Lex Glover, S.C. Department of Natural Resources (DNR) wildlife technician, participants counted and recorded the largest number of orioles they could see at one time, on one, two, three or all four days of the survey period. When possible, sexes and ages were also noted. This year South Carolina had 65 reports and tallied 463 orioles. Reports were down by a few, from last year, but a larger number of orioles was recorded from last year's 304. Orioles were recorded in 14 South Carolina counties and ranged from the Upstate, through the Midlands and along the coast, from North Myrtle Beach to Hilton Head. The Charleston area had the largest number of reports and orioles recorded in the state. There were 304 reports and 1,194 orioles tallied this year in the United States. Florida had the largest number of reports, with 79. South Carolina tied with North Carolina for the second largest number of reports. 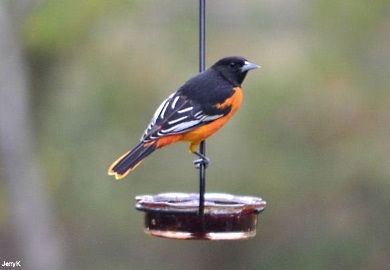 Orioles ranged from Maine to Florida and over to Mississippi and Tennessee. There was even a report from Nova Scotia and a report from southern California this year. Baltimore Orioles are neotropical migrants, that normally winter in South and Central America and migrate to North America to nest. However during the last few decades, this species has begun wintering annually in the Southeast. "Though we are not sure why these birds have begun overwintering," Glover said, "we do know they are responding well to the popularity of backyard bird feeding. Orioles by nature have a 'sweet tooth' and will eat nectar from flowers and wild fruits. Their favorite bird feeding food seems to be by far grape jelly." Orange halves can be used to attract the orioles into your yard, but grape jelly will encourage them to continue returning. Other items they will eat are suet products (homemade, cakes, bark butter, logs, etc. ), sugar water (they will drink from hummingbird or oriole nectar feeders), seed mixes (they seem to prefer nut & fruit mixes), sliced grapes and mealworms (live or freeze dried). Wintering Baltimore orioles begin showing up in September or October, but it may take some cold weather before you see them at your feeders. They tend to feed heavily at feeders during cold or nasty weather, as this limits what they can find, when foraging for natural foods. Orioles usually start heading back north in April. These birds will molt before heading back north, so they will have nice new feathers for migration and for when they arrive to where they will nest. Baltimore orioles are widespread breeders in North America, east of the Rocky Mountains and in Canada, west to British Columbia. In South Carolina, they have nested sporadically at lower elevations in the mountains, sandhills and inner coastal plain. "DNR would like to thank everyone that participated in the survey," Glover said. "Your time and efforts are greatly appreciated." Next year's survey and Great Backyard Bird Count will be Feb. 17-20, 2017. If you have orioles frequenting your feeders or know of someone who does, DNR encourages participation in the survey. For more information on this survey, contact Lex Glover at gloverl@dnr.sc.gov. For more information on The Great Backyard Bird Count, check out its web page at http://gbbc.birdcount.org/.